Colusa National Wildlife Refuge is part of the Sacramento National Wildlife Refuge Complex in California’s Central Valley. This complex consists of five national wildlife refuges (NWR) and three wildlife management areas (WMA) that comprise over 35,000 acres of wetlands and uplands. There are also two photography blinds on Sacramento NWR, one blind on Colusa NWR, and one blind on Delevan NWR. These photo blinds offer exceptional views and photo opportunities for wildlife photographers and are available by reservation via lottery. These images were taken from the blind at Colusa NWR, click on photos for full sized images. At first light, about 7:30 AM, the winter bulrush gives a golden glow to the wetlands. These Greater White-fronted Geese (Anser albifrons) flew in with just enough light to begin taking photographs. In North America, the Greater White-fronted Goose breeds in open tundra areas of the low Arctic from Point Barrow, Alaska to northeastern Keewatin, Northwest Territories, and it winters south to Chiapas, Mexico, thus having the broadest latitudinal range of any arctic-nesting goose1. Range map courtesy of South Dakota Birds and Birding. and landing among the tules. They would fly over the bulrush in small groups of five or six birds and wind their way through the maze of waterways..
often finding their way into my view. Greater White-fronted Geese are sexually monomorphic and being generally monogomous, maintain permanent pair bonds throughout the year. During autumn migration, hundreds of thousands of Greater White-fronted Geese travel the Pacific Flyway to Washington and Oregon, some travelling directly to the Central Valley of California. 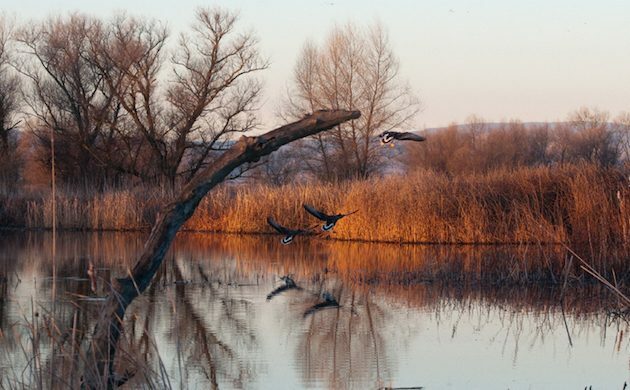 Approximately 44% of the Pacific Flyway’s waterfowl population winters in the Sacramento Valley2. Here they can rest and recuperate for the inevitable northern migration back to their breeding grounds. I had a great time photographing the Greater White-fronted Geese at Colusa National Wildlife Refuge, along with several other ducks and waterfowl observed from the photography blind. I left the blind and headed back to the refuge entrance to see if the vagrant Falcated Duck (Anas falcata) would appear this day. I was not disappointed! The centre individual in image 6 made me look twice Larry with the white up onto the crown and faint yellow eye-ring I had a momentary thought of Lesser White-fronted Goose ( though the bill is obviously too big). I’ve seen these ‘lookalikes’ pictured in field guides but never in the flesh, do you see many like that on the west coast? Very nice post, Larry. Great information and photos. As someone who spent the last year living and birding in west Mississippi, I can assert that it’s safe to amend that migration map to reflect the fact that GWFG (or Specklebellies, as they’re known) over-winter in large numbers in the Mississippi delta at least as north as the Tunica, MS.
It’s a treat to come and read your post! Wonderful shots of the birds! I particularly like the ones in flight..and the last shot too! Fabulous photo of the famous Falcated Duck, the best photo of him I’ve seen! @Alan if you are asking about the Lesser White-fronted Goose (Anser erythropus), I have never seen one. Northern California is full of Anser albifrons however. What I should have been looking for, if I had known in advance, is the larger Greater White-fronted Goose (Anser albifrons elgasi) or Tule Goose. This subspecies winters in the Sacramento National Wildlife Complex however their numbers are estimated at less than 10,000 individuals. They are 10% larger than the Tundra, with darker necks and heads and often showing a yellow orbital ring. They also prefer the protection of tule marshes as opposed to open water. I will be scouring the marshes when I return to the refuge system next month for these Tule Geese and post some photos if I see them. @Nick thanks fore the information! I’m not surprised that these resourceful geese are expanding eastward and northward. Loss of habitat and hunting are their two main conservation concerns. Hello, I wonder if you can help me…We saw a type of goose that I’ve never seen before this last weekend in Morro Bay, CA. I believe it is a juvenile Greater White-fronted goose. Do you have a photo of a juvenile posted anywhere so I can compare? I don’t think they would be typical in Morro Bay, but there was a rainstorm Thursday night and we saw it on Saturday and Sunday…we were visiting for the weekend so we can’t keep going back to check on him. Has Anyone Lost Their Wagtails?